Responsible for marketing what was the very first capital of the United States, NYC & Company have confirmed that the city attracted a record-breaking 10.1m international guests in 2011, a 4% rise over 2010. (see issue 15 January). Sadly Cunard these days does not for the most part use the famous Manhattan Cruise Terminal piers, and the iconic passage along the Hudson River, but you do pass under the Verrazano-Narrows Bridge before turning past the Statue of Liberty and mooring at the Brooklyn Cruise Terminal. Opened in 2006, it is very much a utility building, austere, but it works efficiently, and you are made very welcome. Providing it is not the rush hour a yellow cab will take you into Manhattan in less than 20 minutes for something in the region of US$25 including a tip. The Royal Caribbean Group uses the Cape Liberty Cruise Port, opened in 2004, in Bayonne, New Jersey. 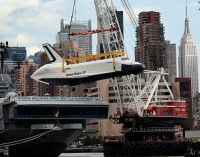 It is a little further from downtown New York than its Brooklyn rival, but much closer to Newark International Airport than Kennedy, which is the nearest to the Carnival operation. Your Editor (and spouse) journeyed across ‘The Pond’ last December. 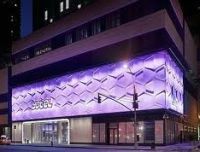 During our stay in New York we chose the new Yotel Times Square, best described as “an experience” but one we would happily return to. The room rates are very competitive for New York, the lounge bar offers one of the best views of the city, and the rooms are ‘different’. It is a proper hotel, 21st century style, and should not be confused with the Yotel ‘sleeping quarters’ offered at Heathrow T4 and Gatwick in London. It is quirky but the staff are friendly and helpful. The clientele were mostly under 30, but it did not put us off. In typical US parlance the ‘Times Square’ title should be taken with a pinch of salt. It is a 10-minute walk down 42nd Street (and full of theatres) from Broadway, and not that far from Hudson and West Side Highway. One checks in at Mission Control and is allocated a cabin or suite. No room service as such or mini bars/coffee makers. Each floor has a 24/7 ‘Galley’ kitchen with complimentary hot drinks and purified water and ice accessible. The trendy Dohyo restaurant offers a ‘Food to Go’ menu if you need take out. The rooms themselves have hand-made organic mattresses, which at the press of a button withdraw to form a couch. The flat screen TV is called a ‘techno wall’ with the ability to stream audio. Wi-fi is free, as are calls within North America. The cabins are ‘big enough’ with a walk-in Monsoon shower. If you want something larger, or have a family to accommodate, bigger suites are available, some complete with a terrace and pool table. For breakfast complimentary tea, coffee and muffins are available every morning, as is a full breakfast service. If when checking out you want to leave your luggage for the day it should be deposited with YOBOT, said to be the world’s most radical approach to storing left luggage. There is some excellent dining within a short walk of the property. Your initial point of call once settled in has to be NYC and Company, the official tourist organisation (open seven days per week). There are five outlets in Manhattan, all only too pleased to help and assist with any questions or bookings you require. 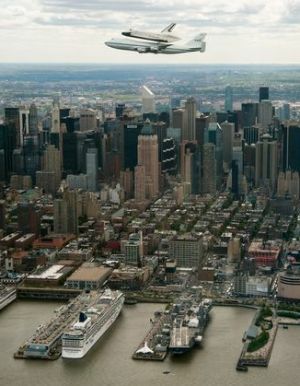 The New York CityPass (US$89) offers six attractions (Empire State Building, American Museum of Natural History, The Metropolitan Museum of Art, The Museum of Modern Art, Guggenheim Museum or Top the Rock, Statue of Liberty & Ellis Island, or Circle Line Cruise) and is valid for nine days. Plus discounts at various restaurants. As a tourist in any city one’s first step is the take the open top bus tour, which is more often than not hop-on hop-off, and normally gives a fine introduction to the metropolis with headset commentary. New York is no exception and there are three Gray Line tours, Downtown (Battery Park and the World Trade Centre site), Uptown (Harlem) and Brooklyn. You can buy a daily pass (48 hours for US$54) and also add on a waterborne trip taking in both the Hudson and East River. Having previously taken in both the Harlem and Wall Street trips we decided on Brooklyn. In truth, whilst an interesting visit, and covering the most populous of New York City's five boroughs, Brooklyn, only part of New York since 1896, just does not have the vitality of Manhattan island. It was once a major shipbuilding centre and the USS Missouri (now in Pearl Harbour) was built in the Brooklyn Navy Yard. The Brooklyn Navy Yard museum is open Wednesday – Sunday with free admission. During a hectic few days we packed in as much as we could, used the efficient (and safe) Subway services, walked in Central Park, and took lunch in Bergdorf Goodman Men’s Store at the top end of Fifth Avenue, opposite The Plaza. It is a sort of small version of Harrods, and just as expensive, except for the splendid café. Worth a visit. One of our policies when in New York is always to visit the theatre, preferably a show destined for London. We took in Memphis, at the Shubert Theatre. It is loosely based on disc jockey Dewey Phillips, one of the first white DJs to play black music in the 1950s. 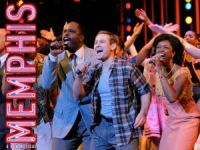 Memphis opened on Broadway in October 2009, won the Tony Award for Best Musical that year and seemingly runs and runs. It is sparkling. We took in a lively matinee performance. The Statue of Liberty itself is presently closed for renovation work but the ferry from Battery still operates and you can walk around the island. 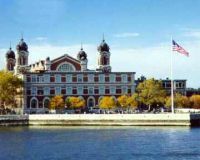 It then goes on to Ellis Island (and back direct). Book your visit in advance (via City Pass) and allow for half a day. A complex of 19 commercial buildings, the Rockefeller Center is a living memorial to John D. Rockefeller and his efforts to look forward from the Wall Street crash and the Great Depression of the early 1930s. It covers 22 acres between Fifth Avenue and Sixth Avenue and 48th to 51st Streets and takes in many eating places, stores and offices galore, and an ice rink. The ‘Rise to the Top’ may not be quite as high as the Empire State Building further down Fifth Avenue but it has its own idiosyncrasies and interest, and the view is terrific. NBC is a long-standing tenant and a studio tour offers the opportunity of taking part in a (mock) interview for the popular ‘Today’ programme. New York is not all perfect. 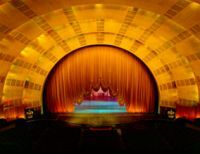 Within the complex we visited the amazing (Art Eco – 1932 built) 6,000 capacity Radio City Music Hall for the Christmas Show. Not only was it expensive – US$120 for a decent seat – but the managers kept selling admission after the show had started, latecomers interrupting all those already seated and trying to enjoy the programme. Zarkana by Cirque du Soleil is the current offering through the summer. On the Lower East Side, once a cesspit of humanity, but now climbing up the social scene, and close by Delancey Street subway station is the Tenement Museum, a remarkable testament to the 19th century history of New York. From 1863, when it was built by a Prussian-born immigrant Lukas Glockner, until 1935, 97 Orchard Street was home to an estimated 7,000 people, from over 20 nations. It is today a National Historic Site. The museum, which includes a visitors' centre down the block, promotes tolerance and the historical perspective of the immigrant experience. In 1935, rather than continue to modify the building to keep up with fire and other regulations, the landlord evicted the residents, boarded the upper windows, and sealed the upper floors, leaving only the street level shop and basement bar open for business. No further changes were made to the upper floors until the Lower East Side Tenement Museum Trust became involved with the building in 1988. As such it stands as a kind of time capsule, reflecting 19th and early 20th century living conditions and the changing notions of what constitutes acceptable housing. 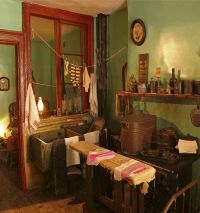 Tours, taken in small groups, start in the Tenement Museum. Book ahead. It is a remarkable experience. A Sunday brunch with a difference (they do evening cruises too) is on one of the four-strong World Yacht fleet, based at Pier 81, just a short walk down 42nd Street from Yotel. 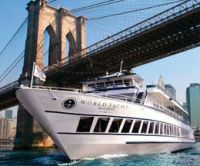 What you get for your US$63 is a combination of breakfast and lunch and a two-hour cruise that takes you round the tip of Manhattan, up the East River, under the Brooklyn Bridge and far enough north for passengers to catch a glimpse of the pristine architecture of the United Nations. It is then back via the Statue of Liberty admiring the world-famous New York skyline. The dining is complimented by an entertainer/pianist. For any visitor the most poignant moment of any trip to New York is a visit to the site of the Twin Towers, The National September 11 Memorial & Museum. The memorial officially opened to the public on 12 September 2011. The museum itself is now largely complete and is expected to be sanctified on or around 11 September of this year. The Ground Zero site covers about eight acres with two pools, the largest manmade waterfalls in the United States cascading down their sides, located within the footprints of the Twin Towers. Each pool is intended to symbolize the loss of life and the physical void left by the terrorist attacks. The sound of the water falling is supposed to drown out the sounds of the city, making the site a contemplative sanctuary. The names of 2,983 victims are inscribed on 76 bronze plates attached to the parapet walls which form the edges of the Memorial pools. Visitor passes are free and available through the Memorial's online reservation system and should be booked ahead. A limited number of passes for same-day visits are also available daily at the 9/11 Memorial Preview Site at 20 Vesey St (at Church Street) from 09:00, and the NYC & Co kiosk at City Hall.